Blogger in Draft (a pre-release version of Blogger) added the option to comment using an OpenID. According to Wikipedia, OpenID is a "decentralized single sign-on system. Using OpenID-enabled sites, web users do not need to remember traditional authentication tokens such as username and password. Instead, they only need to be previously registered on a website with an OpenID "identity provider" (IdP). Since OpenID is decentralized, any website can employ OpenID software as a way for users to sign in; OpenID solves the problem without relying on any centralized website to confirm digital identity." OpenID is great because it allows you to use a single account to sign in to multiple sites without worrying about passwords. The system has been developed by Brad Fitzpatrick for LiveJournal (Brad now works at Google). Some important companies and sites that provide OpenIDs: AOL, Orange, WordPress, Six Apart and others. If you have an account at any of these sites, you also have an OpenID. Unfortunately, very few important sites lets you authenticate using an OpenID. 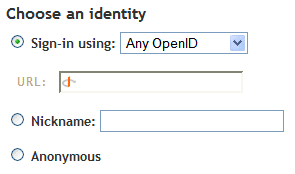 To enable the OpenID integration in Blogger, you need to visit draft.blogger.com, edit the Settings for your blog, choose the Comments tab and select "Anyone" (allows anonymous comments) or "Registered users". I enabled OpenID for this blog, as you can notice if you try to post a comment. Hopefully, this is a small step for a full integration with Google's authentication system. I've read about OpenID many times and still didn't create one because it was still confusing and relatively not well supported. But it seems OpenID may be gaining some ground and I must say that that video demo was very informative (Thanks). Perhaps I'll go set up an account on my own domain name. Cool, a nice feature indeed. Will google ever allow us to set our OpenID account on our google settings account page? Just to let you know that it works like a charm ! I can't tell you how long I tried to get my OpenID URL into graphic on the main page... I read it in Google Reader and came here to add a comment... just kinda scanned to the part that looked like the right place to choose auth information and didn't event pay attention to the fact that there was no comment box... Oops. Anyway, I do much prefer OpenID... especially for sites that require you log in to leave a comment. Saves me from having so many one-time-use type accounts. BTW, This is probably more of a Google/Blogger thing that specifically your site, but the OpenID icon appears next to comments made by people authenticated using OpenID on the "add comment" page, but not on the main post. From what I have seen, not all blogs at blogger have this option yet, is that right? As mentioned in the post, the feature was launched at Blogger in Draft (a sort of Blogger Labs) and you need to enable there. When it will be publicly launched, you'll see it everywhere. Why isn't my name shon? Hardly anyone recognises me by half the url! Yeah - why the small caps on the nick? Google Reader to Update Feeds Faster?